A few weeks ago I attended a course on finger foods for babies with Mummycooks in their home based kitchen in Stillorgan. Josh was eating really well so I wanted to find out a bit more about introducing finger foods and leaving him to his own devices. Siobhan’s demo kitchen is based in her own home but is by no means a commercial kitchen and would make you drool a little with envy if your own kitchen doesn’t quite cut the mustard. I brought Josh along and there was one other baby there. There were 6 participants so it was really interactive. We were given handouts, water and Siobhan started the demo promptly. Her recipes were easy to follow, tasty and gave great inspiration. She cooked some polenta chips, sweet potato with cinnamon & nutmeg and broccoli and cheese muffins along with some homemade houmous. We talked through other finger food options and she gave some really handy tips. We also spoke about the fear of choking, which I must admit is a constant worry when they lob a whole chunk of something in their mouth. You have to get used to the gagging, keep calm and know their limitations but trust them too. I really would recommend these classes for whatever stage you are at. Just the inspiration is good and chatting with other mums about food habits is great too. The classes will resume in the autumn. Siobhan is also the distributor for the wonderful babypotz which you can purchase from her on the day or online too. 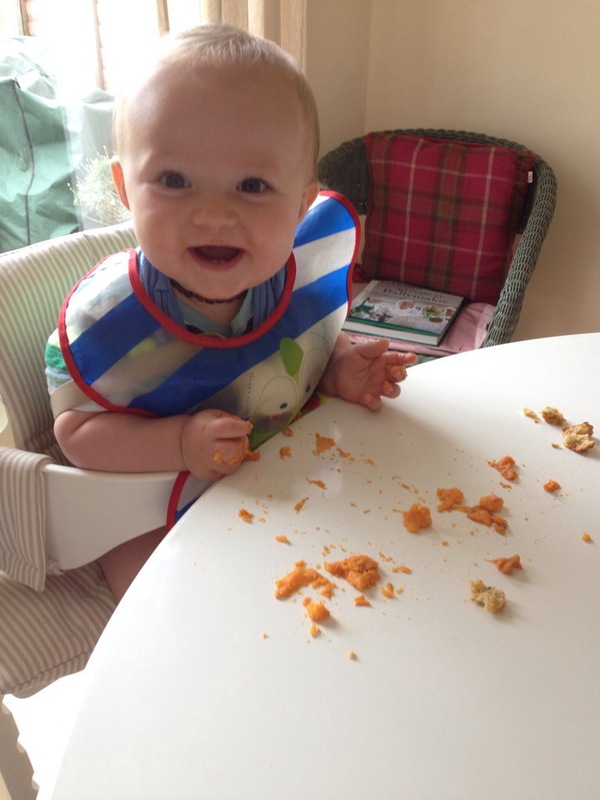 Here is Josh enjoying his sweet potato!